Well, I'm starting to notice yet another pattern in my blogging. About mid-week, I start to get into the wishful thinking mode. The theme is usually focused on something I wish I could do, or change, with little to no effort. Anyway, getting back to this week's theme -- the reunion -- I really wish I could just snap my fingers and be able to attend it, with all of you present, before the end of the year. As optimistic as I am, I'm not delusional! Well, not totally ... I do believe the Yankees still have a chance to snag the AL East flag this year, but that's another story that has to do with my Uncle Chubby (we'll save that one for October!). What could almost make the reunion happen as easily as snapping our fingers? If you're in the area, attend the reunion planning meeting on September 21st. Just having the chance to be back in the Annex should be enticement enough! Second, whether you'll be at the meeting or not, watch for the agenda next week. There will be questions to answer and some research to be done before we gather. The more pre-meeting work we take care of, the quicker we can get the reunion nailed down. Third, go through the Monday MatchUps out here in Saints Scribblings (tech hint: click on the 2007 to the right at the top of the Articles List, and you'll be able to scroll down through all the blog entries for the year). If there's someone on the list you know how to contact, go ahead and do it! Shy? Let us know and we'll contact them for you (we won't even disclose your name if you don't want us to!). Finally, keep watching the Home Page, Guest Book, and Alumni Association pages out on www.saintsdrumcorps.com for updates. Hey There Tuesday Trivia Fans! Chris Quadt, one of our first drum majors and member of our horn line, was not an original member. As a matter of fact, one of the membership rules had to be changed to allow her and others to join. What was the rule? The rule was that our members had to be parishioners of Our Lady of Peace Church in Fords. Chris wasn't a parishioner. What was the Saints Spring Festival of N.O.I.S.E? Where was the first one held? How many times was it held? What did N.O.I.S.E. stand for? Send those cards and letters in with your answers by Labor Day! Monday MatchUps - Bottoms Up! It's Monday MatchUps time again! Today's list was created by going through my spreadsheet from the bottom up to identify members who still haven't been in touch with www.saintsdrumcorps.com. They're also listed in reverse alphabetical order because, as a tall kid throughout my days attending OLP, I know what it's like to always be told that the short kids (or, in this case, the beginning of the alphabet) get to line up first. Pass along your suggestions on how to find them to joparente.saintsdrumcorps@gmail.com. For those of you who are local to Fords, don't forget -- meeting at the Annex on Friday, September 21, 2007, from 7 - 9 pm to plan the reunion!!! Fifty years ago yesterday, I was still an only child, we were living in Perth Amboy, and Eisenhower was in the White House. Five siblings and a husband later, I can honestly say that Karen's birth is among the most profound events of my life. By the end of the weekend, watch for updates to this entry -- I'll have some pictures to share with you, along with some other thoughts on being old enough to have a sister who turns 50 today. A great time was had by all at Karen's surprise party last evening. Hosted by her main squeeze, John, ten of us gathered to help her cross the threshold into AARPville ... in the pictures above with Karen are Lisa Maloney Wagner and John. 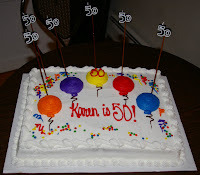 So, what does it feel like to have a YOUNGER sibling who's now 50? I'm still trying to figure that part out ... I'm just grateful we're still able to celebrate these moments together, surrounded by some of the people who are most important in our lives. All for now ... corpsdially yours from jo! First, do you remember your corps number? Not only do I remember mine (84) and Karen's (114), there are many others I can recall quicker than my cell phone number. Oh, the times I could be putting those brain cells to better use these days, you know? There was a post out in the DCA Forum of DCP today about drum corps families ... not how we're all like family, but the people you marched with who are related to you. Many of you may not realize that Karen and I have four other younger siblings who never marched, and there are lots of you out there who many of us think of as only children since we never saw your "other" brothers and sisters. After I read some of the posts, I got to thinking about how many people in the Saints were actually related to someone else either marching in or instructing the corps, not to mention those who ended up related through marriage who weren't otherwise connected through family. A quick scan of the roster out on www.saintsdrumcorps.com turned up around 155 siblings / cousins / children -- almost half the names. Pretty remarkable if you ask me! One last thought on numbers -- have you voted yet for your favorite Alumni shirt design? You have 6 to choose from, and you get to rank them from your most to least favorite. The survey is out on the home page of the site, and will be limited to the first 100 responses. Last week's question: What does NJJCGEA stand for, and how many chapters were there? With an exact answer is Jimmy Pic ... National Judges Jr. Color Guard and Ensemble Association. There were 5 Chapters. PS: Where are the Championship Flags? Pic, I have no answer on the current location of the flags. If anyone knows, respond here. Priscilla French Lyons -- New Jersey Judges Color Guard Eastern Association but I am probably way off! And I think there was 5 chapters??? Now don't I sound positive!!! Choosing to stay anonymous -- I would hope they stood for fair, honest, and impartial judging, but ... and there were 5 chapters where that did or didn't happen. Thanks to all our contestants! Send in those answers by Monday, August 27th to joparente.saintsdrumcorps@gmail.com. First, some sad news ... word has reached us through her mom, Eileen, that Robin Stephens passed away on June 20, 1996, and her dad, Ed, on April 9, 1997. Robin was featured in our August 6, 2007, Monday MatchUps. Her brother Artie is in Stroudsburg PA, and her sister Cheryl (now Carrano, married with two children) is in Forked River NJ. Our sympathies go out to the Stephens Family, and thanks to Mrs. Stephens for keeping us informed. Next, some exciting news -- Eric Meyer (Monday MatchUps, July 2, 2007) has found us! His Where Are They Now information will be posted out on the site soon. Welcome Home Eric! Now, to this week's list ... trying to be a bit more creative, I took the letters that make up Saints Corps and used those to identify members who haven't been in touch yet with www.saintsdrumcorps.com. If you know how to reach them, let me know at joparente.saintsdrumcorps@gmail.com. N - Noel, Tom (Mouse) (horn line) -- Mouse found us on September 26, 2007! S - Slater, Jeff (horn line) -- Jeff found us on September 21, 2007! More often than not since www.saintsdrumcorps.com has been up and running, my drive time has been filled listening to the shows I downloaded from the site and burned to CD. The technology du jour when we marched together means the bulk of our recorded memories are only available in print or audio (we've only been marginally successful in tracking down the few people who filmed some home movies over the years). While there's an occasional sound of rifle clackers or flags shwishing on old tapes and albums, what makes vivid memories possible after all these years are those of you who were in our horn and drum lines ... I can still recall guard work we did because I can still hear the music you made. During my active Saints years, a soundtrack for my own musical tastes was burned into my being. The Latin rhythms from George Lopez, the ever-so-patient first musical notes pried from us by Sonny Cataneo, the explosive growth of talent nurtured by Bucky Swan and George Tuthill -- there's no doubt when you look at my ever-expanding musical collection that they all, as well as some significant others during my corps time, played a huge part in creating the sounds and cadences I still carry with me. There's no adequate way to say THANK YOU after all this time ... know that I carry each of you in my heart and soul for being such a big part of my life. First, the post script: In case you don't remember the original series of questions from July 30th, use the navigation on the right side of the screen to get back to the August 7th entry (has both questions and answers) for Saints Scribblings. All the questions about our first award were answered EXCEPT "Who has the award?" OK, I have been away so I haven't been looking at the web page but I do know who took home the CUP!! MY MOTHER!!! My mother's slip (yes, back then women still had dresses on most of the time!) was driving her crazy through the entire parade. Half way around the track she just could not take it anymore, and in front of the grand stand just took it off. Everyone gave her such a hard time that because she did a strip tease, WE WON! They gave her the Cup for having the nerve to "strip in public." Where it is now I have no idea. So, now we know what happened to the beer stein, sorta! This week's question: What does NJJCGEA stand for, and how many chapters were there back when the Saints were marching? Send your answers to joparente.saintsdrumcorps@gmail.com by Monday evening, August 20th. Each of these members marched 3 years or more ... neither they nor their immediate family members have yet contacted www.saintsdrumcorps.com, nor the Saints Hotline (732-479-1987). If you have any ideas on some way to contact them, please let me know at joparente.saintsdrumcorps@gmail.com. Thanks! First, around 4:30 this morning, I prepared to head into the crawlspace of our home for my first bona fide Tornado Warning ... in case you ever wondered if those pesky Emergency Broadcast Announcements serve any useful purpose, I can assure you that they do ... of course, Richard was out of town for the whole thing! Next, I realized what day it is ... besides being 1 year until the opening of the Beijing Olympics, it's also the 33rd anniversary of Richard Nixon announcing on television that he was departing the presidency on August 9, 1974. Why is this so embedded in my memory? Because I was here in Jersey, in isolation, while many of you were in Lynn MA at the World Open ... that week was the first time my heart was broken (over missing tour, not because of Nixon!). Finally, I noticed that we've now had 100 members officially contact us since www.saintsdrumcorps.com has gone live. Cathy Meyer -- congrats on being #100!!! What was the name / title of the first award won by the Saints? What did we do to receive it? When was it, and where were we? JO, great question, I was playing cymbals on this day. The award was Best Marching Unit, we did the pinwheel, we won a beer mug, at freehold racetrack I think in 69. I have no idea who has it. The MUG is on a shelf in Ray Chemileskis’ kitchen, holding – pencils, rubber bands, a button, 3 pennies and a ticket stub to the 1979 Dream. Seriously, if Mr. C does not have it, and it is found, we should raffle it off, and forward the proceeds to the reunion fund. You got me on that one, but I would say it either had to be a parade,or a Color Guard title. NJA Chapter 3 1971??? Do you have a penchant for trivia? Are useless factoids stuck in your head that are screaming to get out? Join the Tuesday Trivia Team by contacting me at joparente.saintsdrumcorps@gmail.com. First, I'm happy to report another Monday MatchUps connection -- Mary Balderose (Horn Line Monday MatchUps on June 18th) was in touch with Bill Meyer this past week. She doesn't have Internet access, so we're still working on getting additional contact information for her. Welcome Home Mary! We're sticking with a by-year lineup once again this week. Next week, we'll focus on folks who were part of the Saints for at least 3 years. Carol Hickey (Horn Line) - Carol found us on November 7, 2007! Aaron Zolnowski (Horn Line) - Aaron found us on November 2, 2007! It's the 51% segment that you can help us reach. The Member Roster is a quick-loading page out on www.saintsdrumcorps.com. Look for the names that are preceded by an asterisk (*), since these are people not yet connected to the site. This is the source for names we list in our Monday MatchUps segment here in Saints Scribblings. If you find the asterisk next to your name, please send in your contact information by using the Where Are They Now page. If you have any information to share on how to reach someone else whose name is preceded by an asterisk, contact me at joparente.saintsdrumcorps@gmail.com. Thanks!